There's just no getting around it. At some point in our lives, we all ask the same question: What do I do with all of the beautiful small pieces that I've picked up over the years? For those of us living in apartments, this question can come up pretty often as space is at a premium and options for making room are limited. One solution is to put your collections on display with open shelves. Open shelving is a simple and easy way to give your room a chic and eclectic feel while surrounding yourself with the things that tell your story. It takes some styling, but curated collections give a layered, sophisticated feel to your space while letting guests see your pieces through your eyes. Arranging the shelves can become a design project in itself as you judge the right distance and pattern to create visual interest. Best of all, shelves make it easy to rotate your collections giving you an easy option for updating your room or changing your décor to match the season. Whether it's African statuary or chinoiserie plates, presenting your favorite pieces on open shelves can add personality and style to any room in your home. 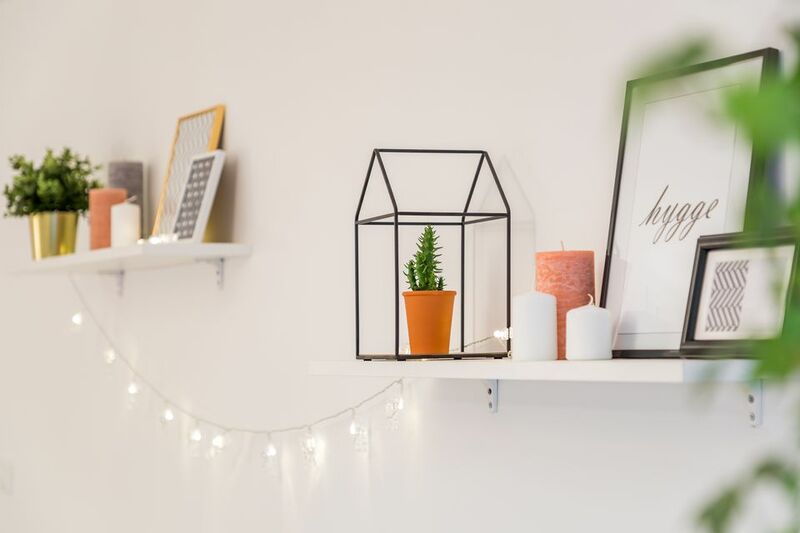 Here are eight helpful styling tips that will assist you in creating a perfectly styled shelf. If you like to do any of your reading offline, you know how quickly books and magazines stack up. But that doesn't mean they have to become clutter. Use your favorite reads as display pieces for shelving that looks effortlessly put together. Create a color story with your books to boost your room's color palette. Or go minimal and present two or three of your favorite covers as an art installation. If you're looking for a storage solution as well as a design idea, try displaying your books vertically in tight groups and anchoring them with bookends. Nothing adds a little life to a room like a bit of flora. Just a few plants can wake up an entire space, adding texture to your shelves and a pop of color to your room. Look for plants with a visual appeal like fresh cut blooms, or an edgy succulent. Fresh flowers also smell lovely, which is always a plus. In a world where pictures are usually hung, leaning your artwork is an elegant way to break the rules. In addition to being incredibly stylish, open shelf art displays are very practical for small spaces. Gone are the hours spent worrying about uneven spacing or wondering if your painting is really straight or if it just looks straight. Simply let your favorite paintings and photos lean against the wall. 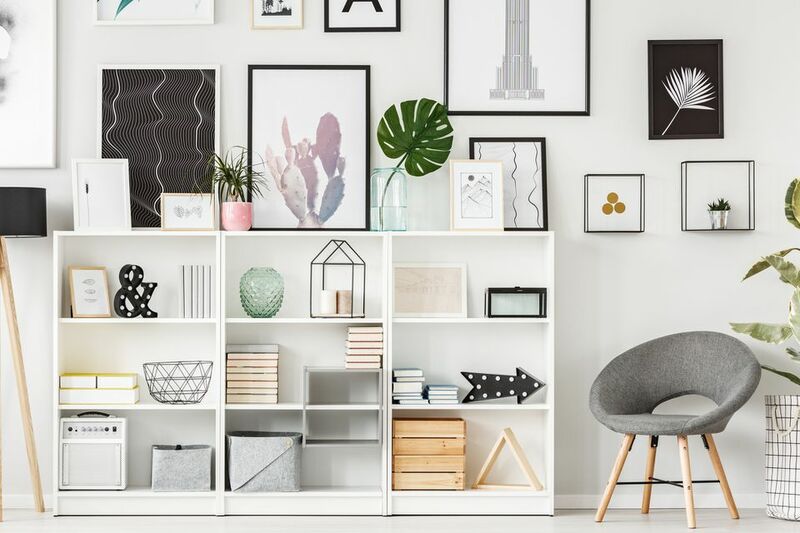 Long shelves and small photos also give you the option to group your pieces together, letting you mix and match for your own in-home art shows. It's a great excuse to pull out all of your art and experiment until you get the perfect look. When arranging items on your shelves make sure that the objects vary in height for a larger visual impact. Whether you choose to display a tall, unique piece of art, or a sleek, contemporary vase, add something that draws your eye upward. If you have a lot of colorful objects to display or if you’re styling shelves in a room with a bright paint color, be sure to include some neutrals to tone the palette down. This creates balance and ensures that your shelves don’t look too overbearing and mismatched. You can even try styling entirely in neutrals for a look that feels sophisticated and timeless. When going neutral on your shelves, whites, blacks, beiges, and metallics are always a great choice. For shelves that feel full and finished, mix and match bigger and smaller pieces to create a layered look. Try starting with a few large staple items, and then accessorizing with smaller, more intricate objects. Combining larger and smaller pieces creates a balanced look. Boxes, baskets, large bowls, and big pictures are great pieces to incorporate either as a foundation or to fill in space. While there are plenty of cool shelves available in basic blacks, whites, and wood tones, don’t be afraid to try something a little bolder. Painted shelves can be a special addition to the color palette of your room or they can add that unexpected pop of color in a neutral space. Or go monochromatic and paint your shelving the same color as the surrounding walls. Adding color is also a unique way to bring attention to the objects being displayed on your shelves, making sure that none of your hard work goes unnoticed. It may sound obvious, but the most important thing really is to display the pieces that you love most. Nothing is better than filling your shelves with the things that are important to you. Show off treasures brought back from recent travels, display your accomplishments, and finish it off with a bunch of things that you just plain like. Home is where we tell our stories through the things that we choose to surround ourselves with. If the items on your shelves speak to you, pique your interests and recall your experiences, then they create a space that is truly your own and that you’ll be that much happier living in.